Sony Pictures Television Networks And The United Nations Foundation Launch The Picture This Festival For The Planet To Showcase Emerging Filmmakers. Submissions For Films To Promote Sustainable Development Goals Close on 30 April 2018. By Mallika Naguran. Culver City, CA 12 February 2018. Have a good story in mind on eco living or sustainable development? Arm yourself with a video camera and shoot for Picture This. You might just win a trip to LA along with Sony cameras and more. This is a call out to budding filmmakers and change makers residing anywhere in the world to make a short film (1-8 minutes) to “showcase the positive future they see for our planet”. Check out the new Picture This Festival brought to you by Sony Pictures Television Networks (SPTN), in partnership with the United Nations Foundation. Video submissions should draw inspiration from the Sustainable Development Goals (SDGs), a set of global goals agreed upon by all 193 member states of the United Nations to end poverty, protect the planet and promote prosperity for all. SPTN launched a similar contest in 2016 across its channel portfolio worldwide, including its flagship brands in Asia, AXN, Sony Channel, GEM, ONE and Animax. These channels will again participate in this year’s festival. Megan Boone, environmental advocate and actress from the hit TV series “The Blacklist has been roped in as a judge, and she will help pick the winners. The judging panel also comprises Kaplan along with industry leaders such as Elizabeth Cousens, Deputy Chief Executive Officer, United Nations Foundation; Marie Jacobson, EVP Programming & Production, Sony Pictures Television Networks; Tom Bernard & Michael Barker, Co-Presidents, Sony Pictures Classics; Mr. N.P. Singh, MD & CEO, Sony Pictures Networks India; Glenn Gainor, President of Physical Production, Screen Gems; Debbie Levin, President & CEO, Environmental Media Association; and Damian Bradfield, President and Chief Marketing Officer, WeTransfer. Elizabeth Cousens, Deputy CEO of the United Nations Foundation, said: “The Picture This Festival for the Planet is an innovative new platform to connect global audiences to what is happening on the ground as people put the SDGs into action in their daily lives. The United Nations Foundation appreciates Sony’s deep commitment to sustainability and its willingness to leverage its creativity and reach to bring the SDGs to new audiences. By celebrating individual stories of people around the world actively working to protect people and planet, Picture This will help inspire others to join the effort to realize these ambitious – and achievable – goals." In mid-2018, eight winners will be flown to Los Angeles to attend the Picture This Festival for the Planet for a day of networking and training alongside industry leaders and social impact partners at the Sony Pictures Studio lot, followed by a screening of the regional winners’ films. The winners will receive airfare and accommodation for two nights in Los Angeles, along with a Sony RX0 Camera and a one year WeTransfer Plus account, with the grand prize winner presented with a Sony A6500 camera and a SEL1670 lens. In Asia, the first 100 successful entries will receive a one-year WeTransfer Plus account worth US$120 each. The Picture This Festival for the Planet is Sony Pictures Entertainment’s latest project to bring awareness to the SDGs. The festival has a number of partner organisations and they are: the United Nations Foundation, the United Nations Association of the United States of America, WeTransfer, Sony World Photography Awards, Sony Alpha Universe and the Environmental Media Association. Supporters include leaders and environmental visionaries as well. In 2016, the United Nations and SPE launched Angry Birds for a Happy Planet, a global youth outreach campaign that leveraged online and social media platforms to encourage action to protect the planet and fight climate change. 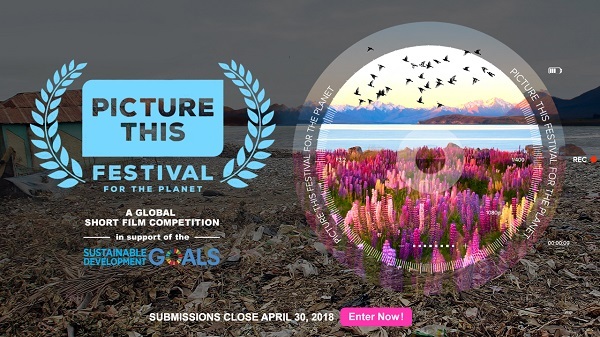 Submissions for the Picture This Festival for the Planet is from 20 January to 30 April 2018. The contest will be open to entrants from select countries worldwide. Please visit sonypicturethis.com for more information and to enter for free. You can follow the Picture This Festival on social media on Twitter, Instagram and Facebook. Visit Sony Pictures Television Networks Asia channels on Facebook for the latest news.